In ninth pAsuram, AzhwAr says “If I who don’t have the means such as karma yOga etc to see emperumAn, desire to see him, is there any means to see him?”. Subsequently, AzhwAr says “How will I being empty handed, yet desirous of seeing my lord who is carrying the enjoyable divine chakra, see him?”. In ninth pAsuram, AzhwAr says “Having nothing in me, if I desirously call him out to see him, is there any means for me to see him?”. enguk kANban – where will I see him? I will not give a handful of food or a glass of water for some one who is hungry or thirsty, respectively; I am unable to control my five senses; I am not being an obedient person who gathers flowers at appropriate times for worshipping and praising emperumAn; [Still] having a heart with desire, very firm attachment which cannot be shaken by any one and with overflowing affection, I who am having strong sins, being ignorant, searched to see the lord who is having enjoyable divine chakra; where will I see him? idagilEn – When one sees a person who is suffering and offers him something after feeling bad for his state, that will very much please sarvESvara‘s divine heart; I have not done anything like that. onRu attagillEn – Even if one does not desire to spend any wealth for others, at least one can physically work by carrying water and offer that [to a thirsty person]; I did not do that as well. aimpulan vellagillEn – Even if one does not engage in helping others, should not one at least avoid what is hazardous for one’s own self? I did not restrain my senses from engaging in worldly pleasures. kadavanAgi … – I did not gather flowers and other materials matching the times, and worshipped the divine feet of your highness, as ordained in SAsthram. But, has AzhwAr not engaged in worshipping emperumAn? He has never engaged in sAdhana bhakthi (bhakthi yOga as a means to attain emperumAn) which is explained in SASthram; but he is only engaged in bhakthi which is the only way for him to spend his life. If these were present, they can be counted as part of bhakthi yOga; but AzhwAr is saying, he has none of these. Here, AzhwAr is not rejecting the activity itself [like karma, gyAna, bhakthi], but the upAyathva (considering those acts as means) [It is explained in mumukshuppadi sUthram 271 that, for a prapanna (surrendered person), karma becomes part of kainkaryam, gyAna becomes part of svarUpa prakASa (realising the true nature clearly), bhakthi becomes part of prApya ruchi (taste for attaining the goal) and prapaththi (surrender) becomes part of svarUpa yAdhAthmya gyAna (knowing the ultimate nature of the self)]. mada val nenjam – madappam indicates the tender nature of the heart – that is, when hearing “bhagavath vishayam” (matters about bhagavAn), becoming engrossed in it at once. vanmai indicates that once a person becomes engrossed, it is difficult to take the heart away from it. valvinaiyEn … – I have sins which stop me from seeing him befitting my eagerness. I did not have my love fulfilled. Neither am I able to control my love towards him nor have I totally lost him since he will manifest himself to even those who slightly desire for him. What was the nature of my sins? ayarppAy – Me who is foolish, ignorant. thadavuginREn – I am searching for him even if he appears in front of me. As said in SrI rAmAyaNam ayOdhyA kANdam 42.24 “… na thvA paSyAmi kausalyE! …” (my eyes went behind rAma and have not returned till now. Oh kausalyE! Touch me with your hands). enguk kANban – How can I who is empty handed, see him? chakkaraththaNNalaiyE – How can I see sarvESvara who is holding the divine chakra in his hand? 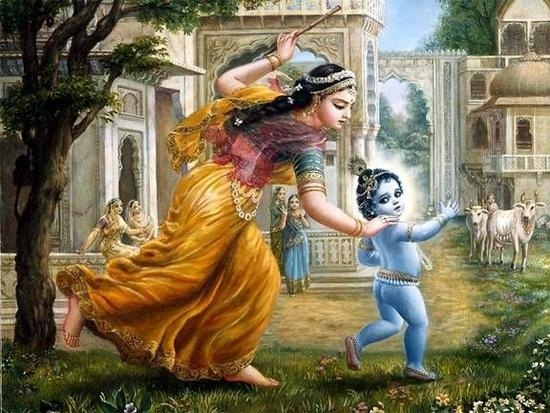 Like mother yaSOdhA held krishNa with butter in his hands, AzhwAr desires to see emperumAn with the sharp chakra in his hands. This entry was posted in thiruvAimozhi, thiruvAimozhi 4th centum on March 23, 2017 by Sarathy Thothathri.